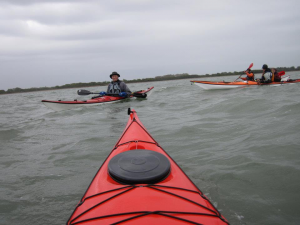 As if one day of paddling in the wind and rain on the South Coast wasn’t enough, Rob, Richard Bate and I stuck around for a second day of paddling, joined at the last minute by Fiona. We were well rewarded for our persistence, and after a great fortifying breakfast at Bill’s fantastic paddler-friendly B+B, we headed down to Sandy Point to meet the assorted members of Portsmouth canoe club. Led by Richard, we set off at a cracking pace, across the flood tidal stream, and into the wind for a slog up the West side of Hayling. The first third of the trip completed, we headed under Langstone Bridge and stopped for a quick break (or lunch #1 for me) at the Ship Inn. Some headed back at this point, and the rest of us continued down the East side of the Island, through Chichester Harbour and past Hayling Sailing Club – the destination on our two previous Bosham/ Chichester Harbour trips – and round the Southeast corner of the Island onto the Sea Front. Rounding the headland was a calmer experience than expected, but the surf landing wasn’t, and Richard gallantly landed first, then helped us all in up the steep shingle beach. Lunch number two was consumed, followed by some delicious ginger and tulsi tea – thanks Fiona! – and we launched ourselves back into the surf and back west along the front. We rounded the Southwest corner of the Island, and sighted our get-out on the other side of Langstone Harbour, with a 4 knot ebb tidal flow between us and it. 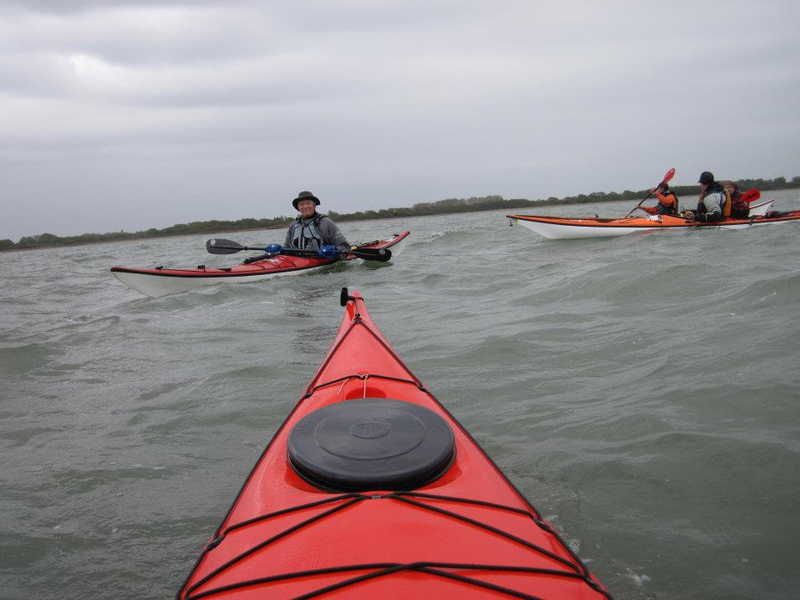 Up we went, eddy-hopping (more just a big slogg against a slightly weaker ebb tide), trying to find a balance between forward progress and deep enough water to get a paddle stroke in, as far as the ferryboat inn on the Hayling side. Then we turned into the flow, and ferry-glided across the ebb tide to our get-out. Great fun was had by all, with a highly successful day’s paddling made strangely more fun by the slightly undesirable conditions. Thanks Rob, Richard, Fiona and Portsmouth Canoe Club for an awesome day! As you may be aware the MOD have the facility Jersey Camp on the IOW, run by SERFCA this facility is an 810acre site with firing range and accommodation for 120 personnel including showers and kitchen. the site has an estuary running through it to open water which could be ideal for canoe training courses.